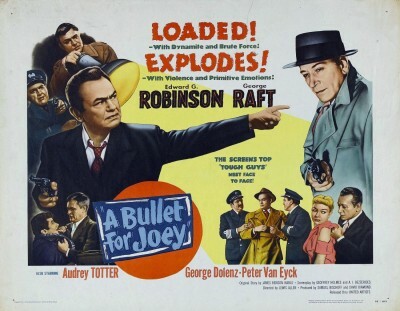 As a movie, A Bullet for Joey (1955) isn't much. But for film buffs, its genre fusing of film noir and ‘50s anticommunism themes with ‘30s Warner Bros. style gangster melodrama featuring "the screen's top ‘tough guys'" (so said the posters) makes for a fascinating if deeply disappointing mix. The tough guys were Edward G. Robinson and George Raft, once big stars at Warner Bros. but who by the middle 1950s had fallen on hard times. Raft, a great screen presence but a famously stiff actor, had seen his fortunes tumble when gangster movies of the type popular in the ‘30s and then again briefly in the late-1940s fell out of fashion. Around this time things were so bad for Raft he was reduced to working as a greeter at the Capri Casino in Havana. Not good, but worth seeing once for its stars and as an artifact of the ‘50s, A Bullet for Joey is a Rent It.